Your dietary choices directly or indirectly affect your health. In order to stay fit, one must opt for nutritious food. If you think that preparing wholesome dishes is not a piece of cake, then you are wrong. You’d be surprised to know that you can cook them at home with ease that too without spending a lot of time in your kitchen. Let’s try the following easy-to-make recipes. Tired of drinking regular milk? Try chocolate almond milk that is not only yummy, but is also loaded with a number of health benefits. This health drink will definitely please your taste buds! Soak a handful of almonds in water for the whole night at normal room temperature. Don’t cover them. Next morning, filter the water and wash almonds with tap water. Blend the almonds and filtered water in a mixing jar for about a minute or until the mixture looks thick and creamy. Strain this prepared almond milk with the help of thin cheesecloth. In a separate bowl, put some chocolates and melt them over a double boiler or keep them in a microwave for 30 seconds. Now, pour 1/3 cup of almond milk into the bowl full of chocolate and mix well. Once combined thoroughly, pour the remaining almond milk and stir again. Your thick, creamy, not-too-sweet and super chocolaty almond milk is ready. With more fiber and less sugar content, digestive biscuits are beneficial especially for those who are on a special diet. Instead of buying them from the market, save some bucks by making them at home. Preheat oven at 350 degrees and line a baking sheet or tray with parchment paper. In a food processor, mix all the above mentioned ingredients except milk, and blend until the mixture becomes somewhat like breadcrumbs. Add milk and blend until the dough is clustered together. Put the prepared dough between 2 parts of parchment paper and then roll it until it is approximately ¼ inch thick. In you find that the dough has become too warm and sticky, put it in the refrigerator so that it solidifies. Shape your biscuits with the help of a round cookie cutter and put them on the baking sheet. Allow them to stand for 10 minutes or wait until they become firm. Cook in the oven for 12 – 15 minutes or until their edges become golden-brownish in color. Take them out of the oven and leave them to cool down. When the biscuits are completely cooled, drizzle melted chocolate over them; or else, immerse the cookies into the chocolate. These light-weight, delicious breakfast cereals are high in nutrients and vitamins. It is believed that children who consume cereal are less tired and more mentally alert as compared to others. Have a bowl of cereal on a daily basis to stay in the pink. Preheat the oven at 350°F and line a baking tray with foil or parchment paper, and grease evenly with baking spray or oil. Beat together sugar, 1 cup cornmeal, and salt. Add water and vanilla extract, with continuous stirring until the batter becomes thin and smooth. Empty the batter in the baking pan and spread it uniformly. Now, mix the leftover cornmeal and 1 teaspoon of water until the mixture looks like breadcrumbs. Sprinkle the cornmeal crumbs on the top of the batter. Now, roast for 10 to 15 minutes, keeping a constant check, until the batter has cracked and dried out. Take it out from the oven and lower heat to 250° F. Allow the pan to cool down and then crush the dough into small flakes using your hands. Put them back into the oven and bake for another 45 minutes or until the crushed pieces become crispy, and golden. Allow them to cool, and then serve with milk. 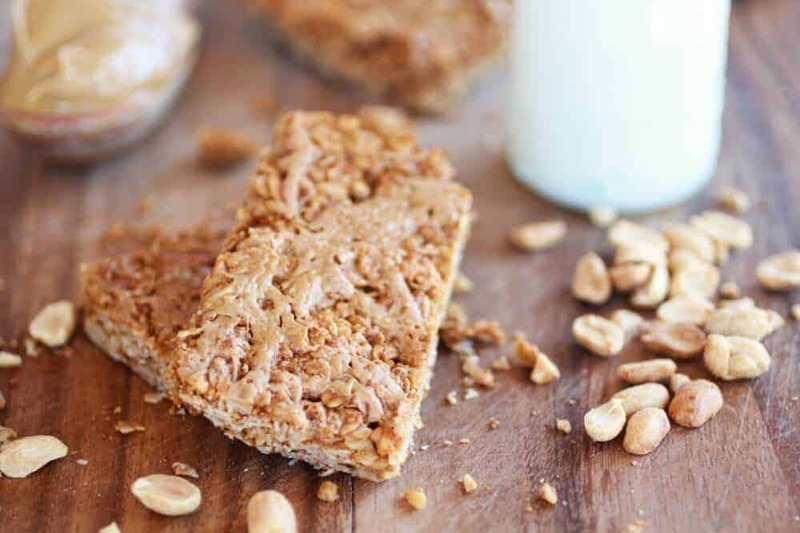 Instead of buying from the market, bake granola bars with no added preservatives and less sugar at home. Granola maintains your cholesterol levels and also aids in preventing chronic diseases, including cancer and heart diseases. Preheat the oven at 350 degrees. Line a pyrex dish of 9×13 inch length with parchment paper. Take a medium bowl and mix together chopped peanuts, oats, rice crispy cereal, baking soda, and salt. Mix ½ cup peanut butter, honey and coconut oil in a microwave safe bowl or a glass measuring cup. Place the mixture in the microwave for about 30 seconds to 1 minute. Mix well so that the coconut oil and butter melts completely and then add brown sugar and vanilla. Now, combine both the mixtures and place them in the pyrex dish. In the meantime, melt the remaining 2 tablespoons of peanut butter in the microwave for 30 seconds, and sprinkle it above the bars. Bake these prepared bars in the oven for 20 to 25 minutes. When they become golden from the top, take them out and allow them to cool down. Cut the bars while they are still firm and soft. Although croutons don’t offer much nutritional value, but when mixed with crunchy veggies or nuts such as heart-healthy walnuts or green pepper strips, they can provide a number of benefits to the body. 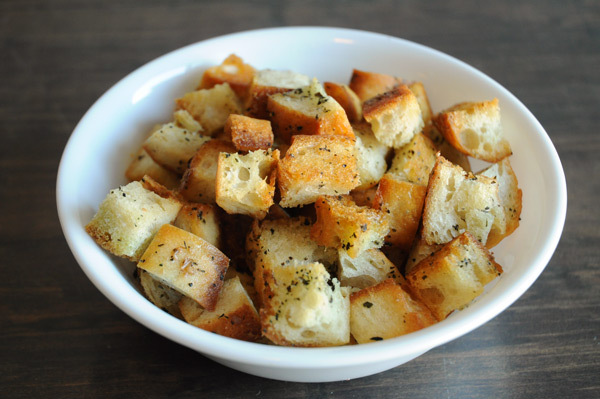 The plus point about homemade croutons is that they are comparatively less greasy and salty. Preheat the oven at 300°F. Combine parsley flakes, garlic powder or salt, and butter, until the mixture becomes clump-free, and the garlic powder completely dissolves. In a medium-sized bowl, coat the cubed bread with the prepared mixture until the cubes are covered uniformly. Now, spread these bread cubes on a baking sheet. Cook in the oven for about 15 minutes, keeping a constant check. Turn over the croutons to the other side and bake for another 15 minutes. Store them in a zip lock bag or air-tight containers. Egg itself is a great source of protein, choline, vitamin B and lutein; nonetheless mixing it with other ingredients is like putting a cherry on the top of a yummy chocolate cake! Take a small-sized heavy-bottomed pan. Place eggs, add water and boil it. When it comes to boil, remove from heat and cover it with a lid. Let it stand still for about 10-12 minutes. Now, place them under cold water so that they become cool before peeling and chopping. In the meantime while the eggs are boiling, mix lemon zest and juice, mayonnaise, pepper, and salt. Add the chopped eggs into this prepared mixture. Add capers, onion and dill. Before eating, sprinkle some additional dill. Enjoy them with baguette and pita chips. Very few people know that coffee is amazing for skin, brain, and body. To prepare double-strength cold coffee, mix together water and coffee. Now, blend the prepared coffee, sugar, milk, and ice in a mixer. Transfer it into two glasses and add up chocolate sauce and whipped cream for delectable flavor. Serve right away. Pistachios provide us with more than 30 different minerals, vitamins, and phytonutrients (including zeaxanthin and lutein). They are lowest in both fats and calories. Make pasta as per the directions given on the package without adding salt and fat. Pass the pasta through a strainer kept over a bowl. Keep ¼ cup of pasta water aside. Wash this pasta using cold water and drain. 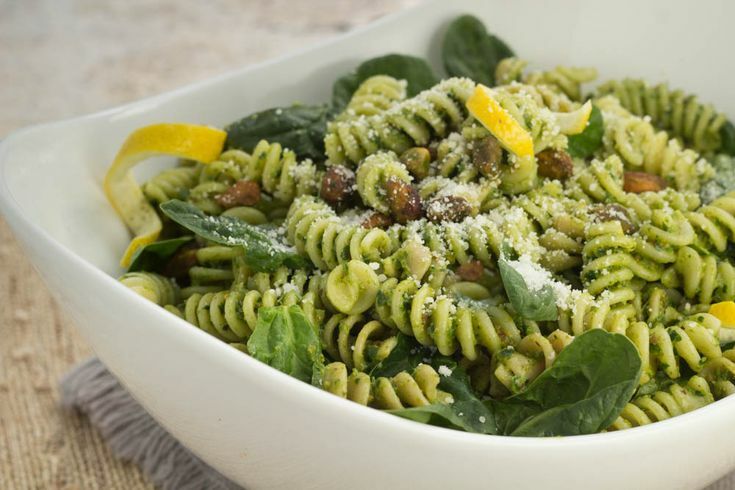 In a food processor, blend 3 tablespoons pistachios, basil, salt, oil, and garlic until the mixture becomes smooth. Take a large bowl and empty this prepared mixture into it. Add the reserved ¼ cup pasta water and cheese. Subsequently, add the pasta and tomatoes; tossing smoothly such that the pasta is coated uniformly. Add the left over 1 tablespoon of pistachios. Serve them with lemon wedges, if you are fond of that flavor. 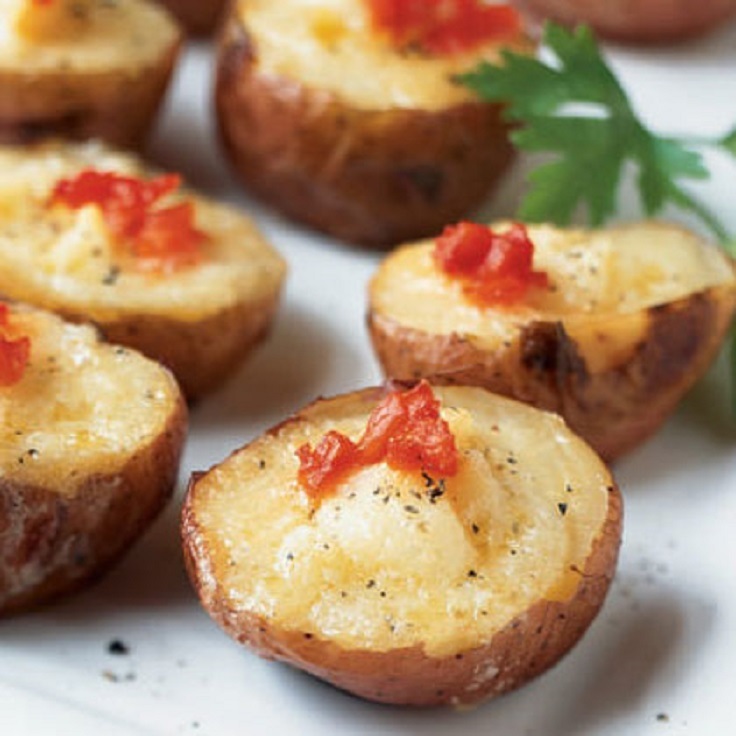 Cheese and potato are well-known for adding up extra fat in our body. But another fact which you do not know is that, when these foods are mixed all together with salmon, they have numerous health benefits. Preheat the oven at 400°F. Brush the potatoes with some oil and add ¼ teaspoon of salt. Put these potatoes in a jelly-roll saucepan layered with cooking spray. Cook in the oven for 35 minutes to make them soft. Thereafter, take the potatoes out of the oven and allow them to cool for 20 minutes. Then slice them crosswise in two halves. Dig out 1 teaspoon pulp from every half, making sure that the shells remain intact. In a separate bowl, mix milk, removed potato pulp, butter, cheese, pepper and the remaining ¼ teaspoon salt. Now, spoon over this prepared potato mixture onto each potato shell. Place these stuffed potatoes on the jelly-roll saucepan, adding ½ teaspoon chopped salmon on each of them. Finally, bake in the oven for about 15 minutes until the potatoes are heated thoroughly. According to a study conducted by the U.S. Department of Agriculture Food Safety and Inspection Service, it has been found that Americans consume about 50 pounds of pork per individual all the year round. They are high in potassium, iron, and other essential nutrients. Preheat the grill to medium-high and add a ½ teaspoon each of pepper and salt in pork to flavor it. Rub the zucchini, peppers, and eggplant with the oil. 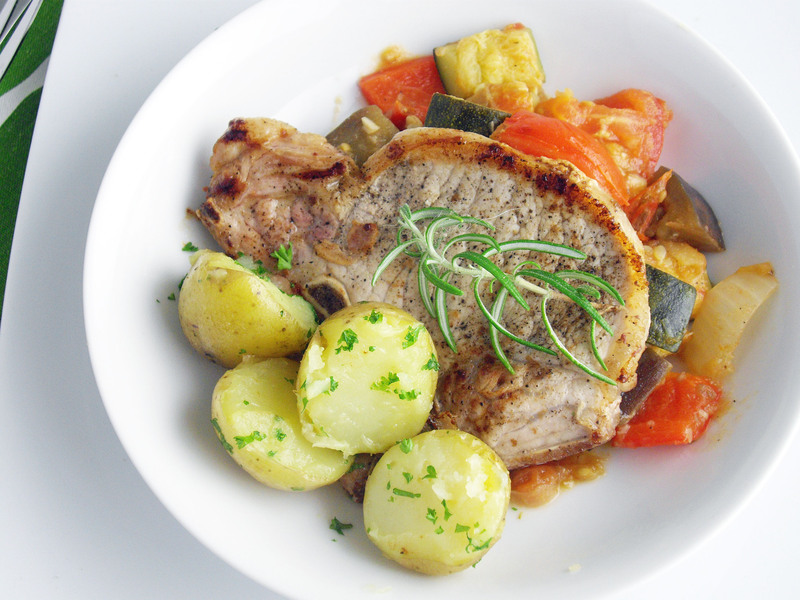 Grill the pork for 5 to 7 minutes; turn over sides and heat until they are thoroughly cooked. Now, slice the grilled vegetables into 1½-inch pieces and place them in a large-sized bowl. Mix ¼ teaspoon salt, pesto and ½ teaspoon pepper and flip them so that they are coated uniformly. Serve hot with additional pesto and ratatouille, if required. Eating snacks between meals energizes you and prevents you from overeating at meal time, plus it also helps sustain a healthy weight. Sesame stick is one such snack you can stick to as it has a number of essential nutrients. In a medium size bowl, mix sesame seeds, flour, turmeric, garlic powder, cracked wheat, beet powder, and salt. In a separate small-sized bowl, combine oil and water. Now, combine the contents of both the bowls thoroughly, and if any bits are left uncoated, coat it with your hands. Divide this prepared batter in two halves; wrap up each of them in plastic and flatten them into inch-thick squares. Place both the parts in the fridge for 30 minutes so that the batter becomes firm. When the dough has become ice-cold, preheat the oven to 350°F. Roll out the batter 1/8-inch thickness on a lightly floured surface and slice it into small rectangles of approximately 1/4-inch by 3/4-inch with the help of a pizza wheel or knife. Or else, directly roll out and slice the dough in any shape. Roll all the pieces between your palms and give them the shape of thin rods. Put them on the prepared parchment-lined baking sheet. Roast in the oven for about 10 minutes, turn over and bake for another 5 to 8 minutes or until the sticks are crispy (don’t over bake so otherwise they may turn brown in color). Take out the sticks from the oven and allow them to cool down at room temperature. Store them in an airtight container after they come to room temperature. You may find this option strange as chips are generally believed to be containing a lot of calories and fat. But here we are talking about home-made chips which could be healthy for us in comparison to those packaged chips we buy from the market. Preheat the oven at 400°F. Take 2 rimmed baking sheets and sprinkle some nonstick cooking spray over it. Cut the potatoes into thin round pieces of about 1/16-inch each with the help of a sharp knife. Put these potato pieces in a sieve and wash them thoroughly with cold water. Remove from water and dry them completely by spreading them on paper or kitchen towel and cover with another paper towel. In a large-sized bowl, mix paprika, oil, and salt. Add potatoes and mix well such that all the potatoes are uniformly coated. Spread these coated potatoes onto the prepared baking sheets, making sure that you spread them in a single layer. Place in the oven to cook for some 15 to 20 minutes or until the chips looks crispy and brown in color. When the chips are completely cooked, you can store them in a paper bag for up to 3 days. Take a nonstick skillet, add oil and cook over medium heat. Now add the white parts of the scallions and onion. With frequent stirring, cook for about 10 minutes or until the onions and scallions become tender and golden-brown in color. Allow them to cool at normal temperature. In a medium-sized bowl, mix the yogurt, scallion greens, cooled onion mixture, onion powder, garlic powder, mayonnaise, pepper, and salt. Cover the bowl with a lid and place it in the fridge for at least an hour. 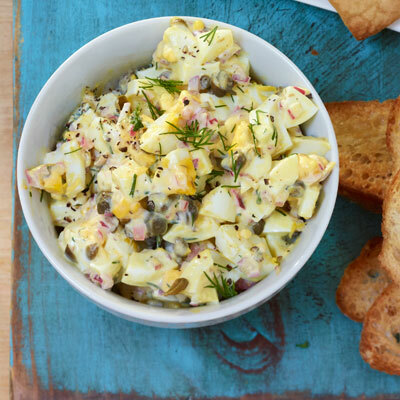 Serve with the potato chips and enjoy its yummy taste! Add some more healthy fats in your diet by including this dish in your meal. In a medium bowl, mix together serrano chiles and tomatoes. Wash the mix under cold water for about 10 seconds. Remove the water completely and transfer the mix in a serving bowl. Add lime juice and cilantro. Stir well. Serve along with tortilla chips to add the extra flavor. Don’t just simply go on the word “refried” as it may sound unhealthy, but that’s not true. 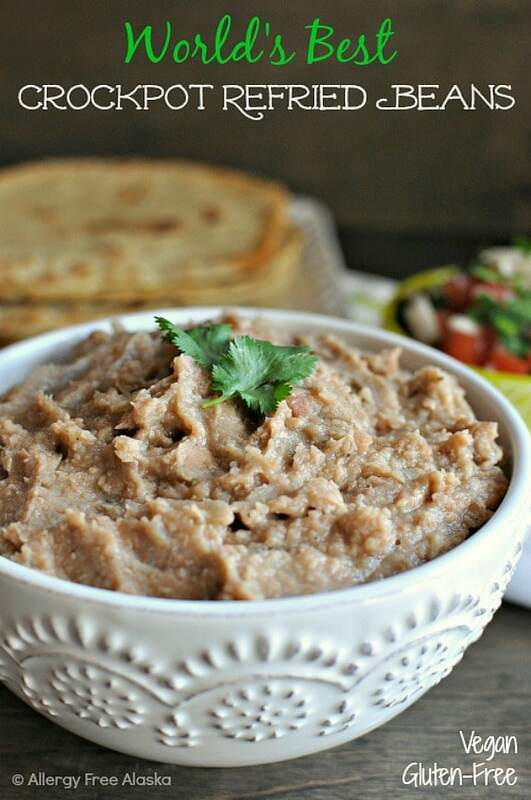 Although they are made of bacon fat, surprisingly refried beans have low fat and are rich sources of protein, plant chemicals, dietary fiber and iron. Thus, they protect us from various diseases. Take a skillet of about 10 inch, add 2 tablespoons of lard and keep it on medium heat. When it becomes hot, add jalapeno, bell pepper and chopped onion. Sauté the mixture for about 8 – 10 minutes or until it becomes translucent and soft. Add up minced garlic and cook for another 1 – 2 minutes. Now, remove the pan from heat. In a cooker, add sautéed vegetables, cumin, beans and chipotle powder, making sure that you have taken clean and dried pinto beans which do not contain any debris or cracked beans. Add 8 cups of water, and then cover and cook on high heat for about 8 hours. Thereafter, drain the beans into a colander set and put it in a large bowl. Transfer the beans to a clean bowl. Add some bean liquids into the bowl. Add kosher salt and blend the beans in a blender until the mix becomes smooth. Serve hot or else allow it to cool down and store it in an airtight container. Place it in the refrigerator. This revitalizing beverage has a number of health benefits and is used to relieve symptoms of flu and cold. 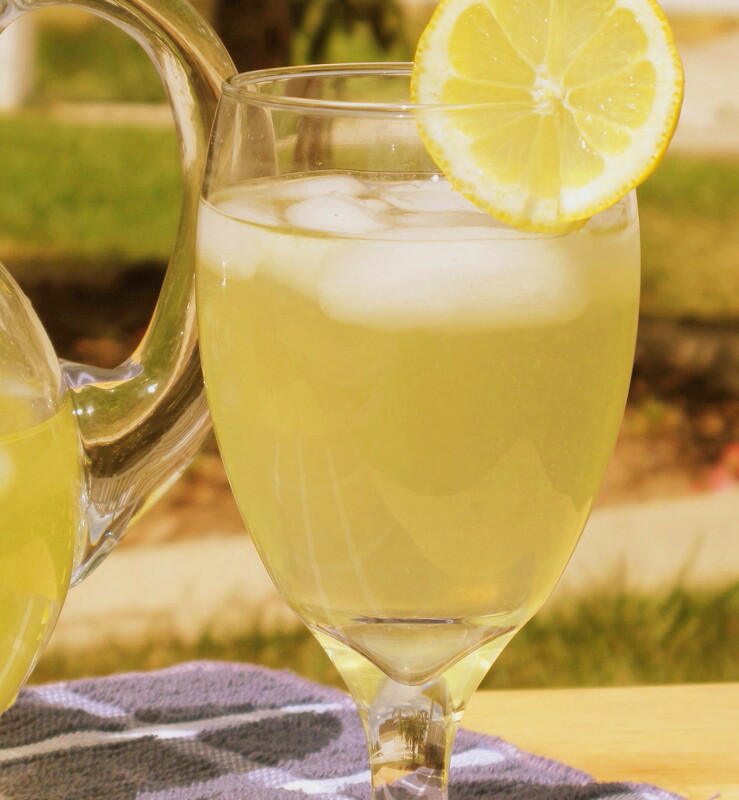 Ginger already has natural medicinal qualities, and when combined with any other ingredient such as lemon, it makes a relaxing and calming tea that improves our immune system and ease symptoms. Take a saucepan and mix water, sugar, and ginger. Boil over medium heat with occasional stirring until all the sugar particles completely dissolve. When the liquid starts boiling, remove the pan from heat and allow the mixture to come to room temperature. Add lemon juice. Transfer the mixture into a clean jar using a sieve. Cover the jar with a tight lid. Store in the refrigerator and use within a month. Even though many people run away from eating mushrooms, but don’t overlook the various health benefits it renders to our body. Get 2 tablespoons of oil and heat in a large skillet. Add mushrooms and spice it up with pepper and salt. Cover it with a lid and cook over medium heat with continuous stirring for about 7 minutes or until the mushrooms become soft and starts turning brown. Remove from heat and transfer it to a bowl. Now, take the skillet and heat 1 tablespoon of oil in it. 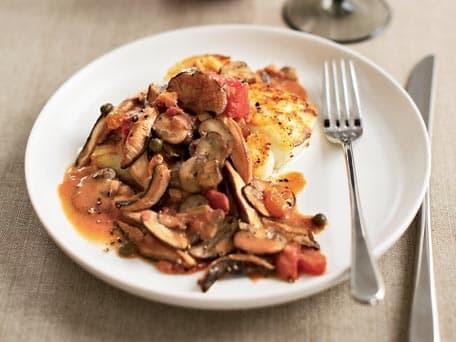 Add mushrooms and cook over high heat for 5 minutes or until all the liquid present in it evaporates and the mushrooms starts turning brown. Add remaining 1 tablespoon of oil and onion, flavoring it with pepper and salt. Cover up the skillet and cook over moderate heat for about 5 minutes, stir constantly, until the onions become tender. Then, add garlic, cover and cook over low heat for 2 minutes while stirring until you smell the fragrance. Add wine and heat for 2 minutes. Thereafter, add tomatoes and cook for some 4-5 minutes. In the meantime, mix up harissa, mustard, miso and milk; add the mix to the skillet. Cook over low heat and stir until the mixture becomes thick. In the end, flavor with pepper and salt. The presence of fiber in fresh figs makes it one of the most impressive foods with wide number of health benefits. Fiber aids in lowering overall cholesterol levels and keeps our digestive system working properly. Add sugar, port, and cinnamon stick in a 2-quart saucepan and bring them to boil. Then heat on medium, cook for about 13 minutes with often stirring. Turn off heat and allow it to come to room temperature. In the meantime, line the cookie sheet with waxed paper. In a microwave-safe cup or small bowl, put chocolates. Cover it with waxed paper, heat it in a microwave for 1 minute or until the chocolate is roughly melted. Mix well until it becomes smooth. Hold 1 fig with your fingers and dip it into the liquefy chocolate, leaving the upper half of the fig. Remove any excess chocolate and then place the fig covered with chocolate on the cookie sheet. 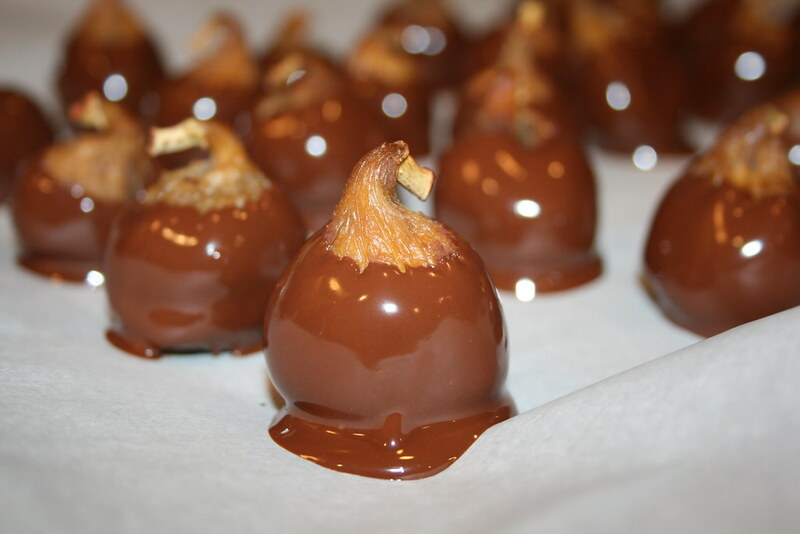 Use the same process for the leftover figs and chocolate. After that, place these figs in the fridge for 15 minutes or until the chocolates become hard. From reducing cholesterol levels to controlling hunger pangs, chickpeas have a wide number of health benefits. 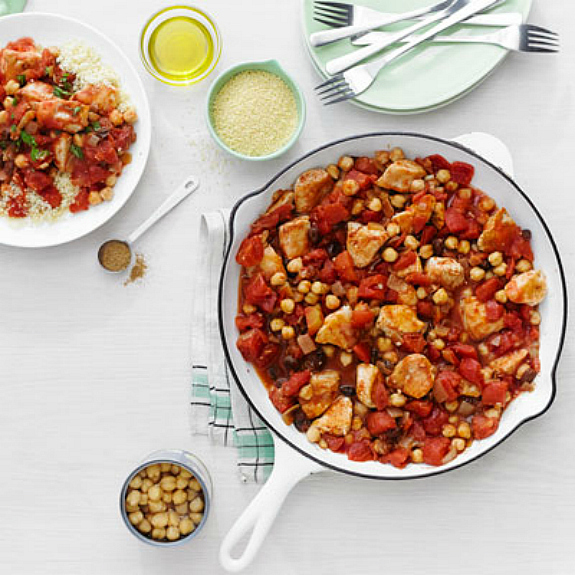 This recipe combines the benefits of both chickpea as well as chicken. Chicken has low fat/calories, and is a rich source of protein. Take a large skillet, add 1 tablespoon of oil and cook over medium-high heat. Add chicken and flavor it with ¼ teaspoon each of pepper and salt. Cook for 2 – 3 minutes per side until its color changes to brown. Empty it in a bowl. Now, add ½ cup of water to the skillet and cook for 2 minutes until no bits are left. Pour this juice into the chicken bowl. Wash the skillet, add the remaining tablespoon of oil and cook over medium heat. Add onion and ¼ teaspoon each of pepper and salt. Cover and cook for 6 minutes, mixing occasionally. Add cumin, garlic and cinnamon and cook for another 1 minute. Add ginger and stir it well. Now add chickpeas, tomatoes and raisins. Allow it to cook. Put the chicken back to the skillet; and cook for about 4 minutes or until the chicken is completely cooked.